As Med One has grown and evolved so has our ability to spread our message to the marketplace. In every interaction we have with our customers we do our best to leave a good and lasting impression. This includes each interaction when visiting our website, social media platforms, phone call, email, and especially our in-person visits. One of our favorite ways to interact with customers and vendors is through having a booth at trade shows and conferences. Only a few short years ago we were exhibiting at a few trade shows and conferences a year. In contrast, this year, 2018 we will be exhibiting at over 10 conferences! We started to increase our exhibiting presence after establishing offices in California, Georgia and now Florida. Together we were able to identify regional and national professional organizations that our customers were often affiliated with for education and certification purposes. These organizations have conferences and events that allow vendors to have direct interaction with their members. This was seen as a great opportunity to reinforce current relationships and establish new connections that help grow our business in the respective areas. 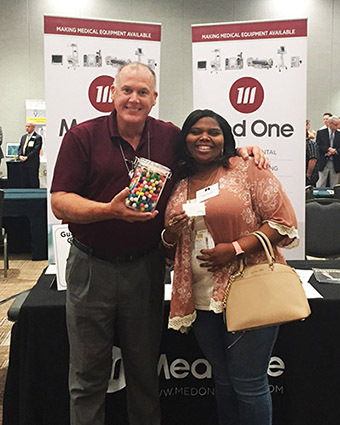 Those who interact with Med One’s booth at these shows have a good experience with a display, promotional giveaways and brochures that are professional, engaging and relevant. All who come by our booth experience a taste of the customer service that Med One customers receive. These personal interactions will continue to be a key to creating valuable relationships in the future growth of Med One.